Imarc announces that the redesigned and reimagined HelloJetBlue has been selected as a finalist for the 21st Annual MITX Awards. “We’re thrilled that the hard work, dedication and collaboration that went into creating the reimagined HelloJetBlue has been selected as a finalist for the 2017 MITX Awards! Imarc announces that the redesigned and reimagined HelloJetBlue has been selected as a finalist for the 21st Annual MITX Awards in the Innovation in Connecting People category. Held annually by the Massachusetts Innovation & Technology Exchange, the awards celebrate the innovation and creativity thriving here in New England. Since 1996, the MITX Awards have grown to become the largest and most prestigious awards competition in the country, showcasing the best creative and innovative accomplishments in the area. This year over 100 senior leaders from Boston businesses judged entries for the MITX award categories. HelloJetBlue is a valuable tool designed to engage, educate and connect JetBlue’s global staff or “Crewmembers” to inform them about key news and resources. This mobile optimized intranet is designed for JetBlue’s remote staff, and is an integral component to the organization, which is designed to build a sense of community. HelloJetBlue features news, tools, alerts and resources to support the day-to-day operations for the airline. Imarc reimagined JetBlue’s previous intranet, with users in mind, to craft a tool that employees would want to engage with. HelloJetBlue incorporates the iconic brand’s identity through animation, tone and even its use of puns, such as “That’s Fly” when a user “likes” content featured on the site. The new HelloJetBlue gives Crewmembers a means to connect in ways that they couldn’t before by communicating important company news, personal travel experiences and mentioning and sharing content with fellow Crewmembers. To learn more about the HelloJetBlue redesign, visit https://www.imarc.com/work/jetblue. 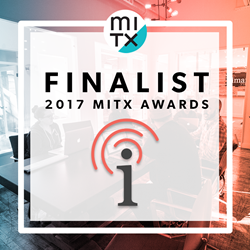 Imarc will be recognized with the other finalists in the Technology category of Innovation in Connecting People at the 21st Annual MITX Awards Ceremony traditionally attended by hundreds of the region’s top marketing, technology and design professionals. Winners will be announced at the ceremony on May 25th at Royale Boston. This year’s ceremony will include host, Kelly MacFarland, dinner and drinks, networking, and of course, the presentation of the prestigious MITX Awards. Tickets can be purchased at http://www.mitxawards.org. Imarc (http://www.imarc.com) is an adaptive, full-service digital agency with a strong focus on web, mobile and custom application solutions. Since 1997, the agency’s team of experienced engineers, UX engineers, designers, strategists and business and marketing experts has been helping over 300 clients do business better. The award-winning, 29-person, nationwide agency has sustained steady growth since its inception and is proud of its many long-term client relationships across different industries. Today Imarc continues to be a premier digital agency that attracts top talent and creates smart solutions for forward-thinking brands. For more information, contact Imarc at hello(at)imarc.com.